It is still I, Anita, holding the reins here! I had meant to get here sooner...but I needed to squeeze in a couple of trips outside Delhi so that all of you could get a(nother) glimpse into rural India. On both trips I was traveling on Indian Rail, and a great way to travel it is. On many express trains today meals are included into your ticket price. The food can be barely edible to fairly good depending on which train you are on and which part of the country you are traveling through. On the first of the two trips, to Bharuch (Gujarat), my colleague and I had an older Punjabi woman as our companion. A veteran traveler on the Indian Rail, she shared advice freely with us. Chatting up fellow travelers is getting rarer and rarer as we (Indians) become more western in our attitudes and redefine our concept of private space. There was a time when it was common courtesy to share your food with fellow travelers; how impolite it seemed if you opened your tiffins and ate all by yourself. Those days are almost gone; we had better enjoy the conversations while it's there. I am sure you want me to share the Punjabi Aunty's gems... My much-younger colleague was telling us how she finds herself cooking the same-old same-old all the time. Well, what do you know? Have you tried adding sambar powder to your bhindi subzi? I interjected that I had tried it with potatoes...Well, had I tried it in curried potatoes with poori? And, did you know that one of the best ways to cook the uninspiring bottle-gourd is with wadi? [Cook it just as you would wadi aloo, replacing the potatoes with the squash.] Guess what was for lunch the day I returned? Finger-licking good; you have my word. Another very intriguing tip she gave, which I haven't tried yet, was about the addition of salt. Most of us add salt to our subzi after we have added the vegetables; well, if we add it to the tadka it will be quite another story it seems! Our client in Bharuch served us quite the breakfast after we declined the hotel buffet. Let me try and see if I can recall it all. There was dhokla, sev khamani, pattis (fried dumplings filled with savoury-sweet spicy potato mix), bakarwadi, bhajjia (with methi - yum)... washed down with masala chai. Everything other than dhokla, was deep fried, and most had besan as the main ingredient. The variety of besan preparations in vegetarian Gujarati and Maharashtrian cooking is truly astounding. I learnt to make Khandvi, also called surali chya vadya in Marathi, from my mother-in-law, a popular Gujarati snack which is quick, easy, and also low-fat. It hits the spot when you are looking for some healthy instant gratification. Whisk all ingredients together to form a smooth slurry. Cook in a heavy-bottomed or non-stick pot till it has thickened and the besan is cooked (5-7 min). Use a few drops of oil to grease inverted thalis or baking sheets. Spread a ladleful of the cooked paste quickly on to the prepared surface, as thin as possible. You have to be quick as the paste will keep thickening as it cools. I use a wooden spoon to do this which allows me to handle a very hot paste. Repeat till you have used up all the paste. While this cools, prepare the tempering. Heat the oil in a heavy pan. Add hing followed by the mustard seeds. Cover the pan to catch all the spluttering seeds. Turn heat off. After the paste has cooled (a few minutes), score at 1.5" intervals and roll from one end. Alternately, you can make one big roll and then cut into 1.5" sections. Spread the tempering evenly over the khandvi. Sprinkle generously with grated coconut and cilantro. Will stay fresh in the refrigerator for up to three days. With a recipe that is very much at home in Manisha's kitchen, I hand her blog back. I hope her loyal readers enjoyed this brief interlude (the recipe is a bonus!) and have not changed their feeds already. The other trip, it was to Wagah (near Amritsar)... another time perhaps (another place?). What a lovely trip! Traveling in China was a bit like what you remember, especially in second-class sleeper cars, where everyone would put on comfy clothes and bring out the food and playing cards and settle in for some serious socializing with all and sundry. Those khandvi look delicious, though I have no idea what they might actually taste like! But gosh..the khandvi. Looks absolutely wonderful! And BTW, some westerners share stuff on trains...I had a total blast on my one and only train-trip- definitely the best way to travel! Anita, you sure know how to make me jealous. e.v.e.r.y. single time! btw, your zafrani zamudud is fantastic, if I haven't told you already! khandavi looks great, I can never get it right to thick.. I miss the trains journeys they used to be so much fun..
i remember train journeys like that where u start out talking casusally and soon u are all sharing food.here u don't even order food together(to be shared) when friends go to a restaurant! !Its each to his own plated serving! !the Kandvi looks very rich and cool..hardly like a healthy dish. Khandvi looks wonderful!! Looks like you had a great trip. Nice post, Anita! What you said about the train journeys - in the South, we've had biscuit thieves in the last few years, so we're even more careful now - they feed you drugged biscuits and strip you of your things.apparently they even share the same biscuits so you won't suspect!!! That khandvi looks lovely. I make a microwave version, and the toughest part is the spreading - it almost always becomes too thick and cool by the time I spread it! Thanks for the tip about the wooden spoon. That Khandvi sure looks gr8. I tasted khandvi for the first time at a gujarati friend's place. Her mom had made excellent thin yummy khandvi's. Guess the trick lies in getting the spreading and rolling right. hey anita, this is my first time on your blog. You have nice recipe collection & nice photos. I love khandvi ..I can eat it any time. See now you made it more interesting. By continuing to take IFR hostage instead of playing the joke just for a day :) Keep up the good work (Manisha who?)!!! I have grown up on such railway dabbas. Every train journey from Calcutta to Bombay when we were there was made easier because of our companions and the shared meals. The salt/ tadka thing is so radical it has to work..will keep you posted. Khandvi or surali chi wadi-call it anything, it will be one of the yummiest snacks ever :). The best part is the garnish. I agre with your observation on socializing in the train thing, totally! It can be quite a comfort in the two day long train journeys :). And i see Mr. Gawar Gogji is doing quite a bit of PR for me :-D.
okay, darling. now you can take over jugalbandi. Oooh! Thanks for this great recipe! The pics are yummilicious, too! Anything besan is a hit with us. We've made two long train journeys in the US. From Denver to Chicago (at least 14 hours) and from Denver to California (at least 36 hours). We didn't share any meals because I wasn't carrying any food. The first time we were traveling back after closing on our new home in Colorado. The second time I had just waved goodbye to about 10 visitors who had stayed with me for about a week. Believe me, food was the last thing on my mind! I just needed sleep! Besides the train had a dinner coach where they served us the choicest microwaved food ever. I think they cooked the breakfast on the train though. But! We did share our table with at least one other person each time and we turned around to chat with those at the neighboring tables. We also exchanged notes and laughed with the hostess. And, in the lounge car we got to know more people. I remember taking my Japanese friend on the Deccan Express to Lonavla in the mid-90s. I had worked all night so I slept as soon as we nudged ourselves onto those wooden seats. No-one believed me when I told them that I took the CEO of a company with near $100 million in revenue on an unreserved train journey by second-class in India. He talked to everyone around even though no-one understood each other. The only time he disturbed me was to poke me in the side with an aghast "Maaneeeshaaa?1" Ya. We'd just pulled out of VT (CST to you Mumbai-ites) and he couldn't believe what he was seeing. It was early in the morning. By the time we had pulled out of suburban Bombay, he was completely desensitized to it. Musy, if you say the garnish is the best, she will come after you with her paratha-making belan, take over your blog and say you like things swimming in oil. But I agree with you. If the phodni lacks the oomph, this thing falls flat and is just cold cooked besan. And, hello, Ashwini. Have we met before? And just to make it clear, you are now officially blogless. Because your blog is still belong to me and now my blog is belong to me, too! Muahahahaha. There is so much live and movement in that last photograph. I found myself staring, mesmerized. Kitt: I would like to know how the Chinese get their daily quota of tea on the trains! We have vendors walking up and down the aisles with a portable can of tea. Other than the tricky spreading of the paste, khandvi is quite easy to make. Pelicano: You are right perhaps :D Potatoes are my first love. (I forgot about that recipe even though I seem to have gotten there first!) Do share yours; I have a long season of cooking ghia ahead of me...sometimes twice in the week. It is basic human nature to be social ("Man is a social animal," as we were taught in school; it is just that changing times are making us wary of 'strangers'. Rachna: So, did you? Isn't it amazing how besan lends itself to so many ways?! Mallugirl: Traveling by train gives us a romantic glimpse of our diverse landscape...The Konkan Railway have got to be one of the most picturesque routes... through the NE Himalayas too (Darjeeling! ), and through Kerala I bet! Kalai: Thanks. The trip was a little hectic, but our Punjabi fellow-traveler helped the time pass easy on the onward journey! Sra: I think that malaise has spread, and is partially responsible for our distrust towards strangers. You really can never tell! Raaga: I am back! And not heading out again anytime soon...That meet sounds like a fun idea! Just tell me when. Arundhathi: Yes, when to take the cooked paste off the fire is critical. A minute too late, and it becomes too thick. My first time I had much thicker rolls. So I don't wait for it to cool at all now! Vandana Rajesh: While the spreading must be quick, the rolling is a breeze. The best part is that even if you don't get it right it still tastes great! Trupti: Err...this is not my blog anymore...I am blog-less at the moment (or that is what some people will have me believe). But thanks for coming by, and I am sure Manisha will be adding to that collection in her own sweet time :D .
Ashwini: You are my gal! I hope our happy train journeys are always there and like all other good things, do not come to an end but just reinvent themselves. It was nice to chat with our fellow traveler in AC comfort, be served every now and then (lots of tea! ), and look at the trees go by from the much larger windows, and not have to worry about the gunky hair (God, how dirty hair would get from all that looking out the window!) ...definitely better. Musical: There you are! That was quite the friendly Sardarni Aunty we had with us. She totally made the evening go by so fast - tellis us about her family and friends, and asking about ours. I even asked her if she had a recipe for making wadi! Coarse ground spices, and soaked ground urad, is all that she said was there...must try it out soon... Sorry, I forgot your wadi-toriyan recipe - my loss! Bee: It's a promise? I'll be right over! Manisha: Well, well...I would have said, "get your own blog!" but you already have two, is it? You seem to have taken the "swimming in oil" to heart :D . Come, sweet Manisha, post a killer recipe quick...else, your comments are belong to me! I can drop by, every now and then (you haven't blocked me...) - I'll bring the soul along? You put the kettle on...we'll have tea first. 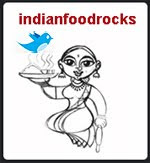 Padmaja: When you can get other's to serve it, even better! Cynthia: The fields were a beautiful gold, and the poplars had all turned green. anita, you want me to send some goondas over to retrieve your blog? Anjali: Yes, it's me! Who else would take you on trips through India! Manisha: Do it. Now. Or else... I'll reclaim this space and have all your loyal readers change their feeds....he he...You'd better include a recipe - you can't have a Mad Party without food. Khandvi looks great. I love all your recipes. pearlsofeast: Thanks! You are probably new here, therefore, welcome to IFR! The rest of the recipes here are not mine - I am just an interloper - here today, gone tomorrow! But all the recipes here are wonderful (the conversation - even better); some I have tested, and some I have twisted. Nan (and friends at intelliwhatever): Wrong post man (I am so funny today!). I guess you want to address Manisha, who is on her way back from A Mad Tea Party. She'll be right along (if the Queen Bee didn't really mean it when she said, "Off with her head! ")and let you know what she thinks of this swell idea of having her cooking demos all over the web! Unbelievable! Nan, it's not ok for you to use my comment space to advertise your business. I would appreciate it if you refrained from doing this on my blog. Please have the courtesy of asking bloggers for their permission before indulging in such self-promotional behavior. We call it comment-spam. Khandvi are new to me, but I'm completely intrigued. I love the process photos too. They look like they're actually pretty easy to work with. How lovely and delicious! Lovely recipe and photos, although it looks like it might be a bit tricky to make for a first-timer, the way dosas or crepes can be. I love the combination of savory and sweet here, so I'm going to try it soon. Thanks, Mani . . . uh, Anita . . . Awesome website. Thanks for the mouth watering recipes. I'm going on a road trip. Any suggestions as to what to prepare that will last for 10 hours without getting spoilt. Vibha, I hope this is not too late for you as I just got back from a road trip myself, latter part of which included camping. Carry a cooler and freeze water in sturdy plastic bottles. These work much better than bagged ice and you have cold water to drink as it melts. Make sure that you have a refrigerator in your room wherever you stay - even if it is just for a night - and refill the empty bottles and freeze them again. For food, we carried basic stuff: bread, peanut butter and jelly. I had made a ton of idlis, to which my sister added a fiery phodni (tempered oil with mustard seeds, cumin seeds, hing, finely chopped green chillies and kadipatta), after cutting them into 4-6 pieces. The phodni has to be rather excessive as it must coat each piece well. The crumbly mixture at the bottom of the box is the best! And it needed no sambar or chutney. I did not refrigerate this and it lasted for two days at mostly 80F temperatures. Parathas, again with more oil than you would use normally, last well, too. We made spicy dal parathas that were very filling. And, I carried my lemon pickle - the lack of oil in the recipe worked to our advantage as I did not have to worry about leaks and spills. Methi na thepla are also a great snack to carry. In my cooler, I carry fresh veggies like a couple of tomatoes, cucumbers and some carrots. And pepper jack cheese and butter for those who can't do without. (I can carry all this without worrying about air-tight or water-proof packaging because of my no-mess cooler.) This comes in handy for a quick sandwich at a pit stop and the kids can munch on the carrots while the sandwiches are being made. While some of the food is greasier than normal, it is much better and more refreshing than eating junk food at fast food restaurants and drive-thrus.